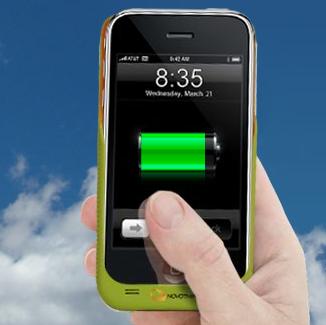 Introducing the first Apple approved solar powered iphone & ipod charger by Novothink. Combining the goodness of green technology with lots of fashionable colors. The custom-sized skins weigh less than three ounces and with direct sun, charges your completely dead phone battery in two hours. These beauties just appeared on the market on 9/9/09. Currently selling for $69.95 from SolarArcadia. And they walk the walk. 2% of all sales go towards renewable energy r & d.
I predict you are correct. They are only available on pre-order right now.